My work focuses on U.S. Presidential and political history, nuclear history, and the Cold War. I’ve spent a lot of time grappling with the challenges of documentary editing and digital history. I joined the University of Virginia in 1999 after completing my doctoral work at the University of Queensland, Australia. I was at UVA for about 15 years with the Miller Center’s Presidential Recordings Program, including about 6 years as the Program’s chair. I’m now a Senior Research Fellow at the National Security Archive. You can find some of my work with the media on places like NPR, Time Magazine, the History Channel, the New York Times, the Washington Post, BBC Radio, Reuters TV, WTOP Radio, C-Span Book TV, C-Span Washington Journal, and C-Span Radio. My most recent book is The Fourteenth Day: JFK and the Aftermath of the Cuban Missile Crisis (W.W. Norton). You can find much more about it, as well as quite a lot of underlying research and documents, here). My other books are on nuclear deterrence, US-Australian relations, 20th century political history, and the Kennedy and Johnson’s White House Tapes. You can find my scholarly articles in places like The Journal of Cold War Studies, The Bulletin of the Atomic Scientists, and the Australian Journal of International Affairs. My op-eds have appeared in the Daily Beast and HNN. You can find some of my most recent experiments in digital history on this site and the website I built for my most recent book. Of particular note are the recent versions of my long-running efforts to create transcripts synchronized with the corresponding audio and better historical data visualizations. Having just finished and published three rather massive volumes of brand new annotated transcripts from the JFK tapes for the period October 1962 through February 1963, I’m now turning my attention back to some book projects I’ve had in the works for some time. They include a book on a Cuban terrorism plot in the United States (working title Black Friday) and a book on JFK and British Ambassador to the United States Sir David Ormsby-Gore. I’m also developing some new digital history tools that will be prototyped on this site. You can contact me here and follow me on Medium. HistoryinPieces.com is my personal site. I’ve collected an awful lot of material over the years. Much of it isn’t readily available elsewhere. I’d prefer to share it than let it disappear into my forgotten files. So I post on this site short-form history of various kinds–short essays and research notes, along with reliable historical data that isn’t readily available in easily digestible form elsewhere, nuggets from the archives, digital history experiments, news, and other items I come across as part of my historical research and writing–in the hope they might be of interest to other researchers, teachers, students, journalists, or anyone else looking into these issues. Found something you’d like to cite? That’s great–I’m glad you’re finding site to be useful. If you’re publishing online, the simplest option is to link directly to the article on this site from your own piece. I plan to keep the URLs stable long-term–I hate broken links. David Coleman, "Castro's Five Points," HistoryinPieces.com (https://historyinpieces.com/castro-five-points). Whether or not you want to add the old-fashioned “accessed on” bit is up to you, but the Chicago Manual of Style doesn’t require it. Most of my articles on this site also include a published date–feel free to include that, if you like. Then again, if you’re publishing in print, the house style will provide guidelines. And thanks in advance for the courtesy of appropriate citing. I try my best to acknowledge my sources and appreciate the same. 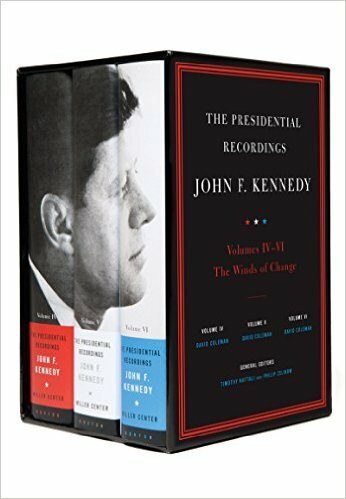 The Presidential Recordings: John F. Kennedy: The Winds of Change, volumes 4-6: October 29, 1962 – February 7, 1963, edited by David Coleman. New York. W.W. Norton, 2016. The Fourteenth Day: JFK & the Aftermath of the Cuban Missile Crisis. New York: W.W. Norton, 2012. The Presidential Recordings: John F. Kennedy, volume 4 (October – November 1962). Editor. New York: W.W. Norton. Forthcoming. The Presidential Recordings: John F. Kennedy, volume 5 (November – December 1962). Editor. New York: W.W. Norton. Forthcoming. The Presidential Recordings: John F. Kennedy, volume 6 (December 1962 – February 1963). Editor. New York: W.W. Norton. Forthcoming. The Presidential Recordings of Lyndon B. Johnson, Digital Edition: Lyndon Johnson and the Vietnam War: Escalation, July 1964–July 1965. Editor (with Marc Selverstone). University of Virginia Press Rotunda Digital Imprint. 2010. Real-World Nuclear Deterrence: The Making of International Strategy. Westport, CT: Praeger Security International, 2006 (with Joseph M. Siracusa). Australia Looks to America: Australian-American Relations Since Pearl Harbor. Claremont, CA: Regina Press, 2006 (with Joseph M. Siracusa). The Kennedy Tapes: Inside the White House During the Cuban Missile Crisis, concise edition. Associate Editor. Edited by Philip Zelikow and Ernest May. New York: W.W. Norton, 2002. Depression to Cold War. Westport, CT: Praeger, 2002 (with Joseph M. Siracusa). The Presidential Recordings: John F. Kennedy: The Great Crises, Volumes 2 & 3. Edited by Philip Zelikow, Timothy Naftali, and Ernest May. Associate Editor. New York: W.W. Norton, 2001. “Kennedy, de Gaulle, et les grands crises de Berlin et Cuba,” in Conflit et Coopération dans le Relations Franco-Américaines, du Général de Gaulle a Nicolas Sarkozy, edited by Renéo Lukic. Presses Universite Laval, 2009. “The Missiles of November, December, January, February … : The Problem of Acceptable Risk in the Cuban Missile Crisis Settlement.” Journal of Cold War Studies 9, 3 (Summer 2007): 5–48. “Camelot’s Nuclear Conscience.” Bulletin of the Atomic Scientists (May/June 2006): 40–44. “The Making of Multilateralist Germany: Implications for U.S.-German Relations.” Nação e Defesa (Nation and Defense) (Portuguese National Defense Institute) 112 (Autumn/Winter 2005). “Eisenhower and the Berlin Problem, 1953–1954.” Journal of Cold War Studies 2, 1 (Winter 2000): 3–34. “Scaling the Nuclear Ladder: Deterrence from Truman to Clinton.” Australian Journal of International Affairs 54, 3 (November 2000): 277–96 (with Joseph M. Siracusa). “The Berlin-Korea Parallel: Berlin and American National Security in Light of the Korean War.” Australasian Journal of American Studies 18, 1 (July 1999): 19–41. LBJ DVD, Companion to The Presidential Recordings: Lyndon B. Johnson: Mississippi Burning and the Passage of the Civil Rights Act: June 1, 1964-July 4, 1964. New York: W.W. Norton, 2011. “Deterrence” (10,000 word essay). The Encyclopedia of American Foreign Policy: Studies of the Principal Movements and Ideas. second edition, edited by Alexander DeConde, Richard Dean Burns, Fredrik Logevall, & Louise Ketz. New York: Scribner’s, 2001. “Peace Corps,” “Antiwar Movements,” “Berlin Wall,” “Berlin Airlift,” “Cuban Missile Crisis,” “Hostage Crises,” and “Airplane Hijacking” (400–1,500 words each). The Dictionary of American History, third edition, edited by Stanley Kutler. New York: Scribner’s, 2002. “Kennedy, John F.” (1,000 word essay). Americans at War: Society, Culture, and the Homefront, edited by John P. Resch. New York: Macmillan Reference, 2005.
Review of Spies Beneath Berlin by David Stafford (London: John Murray, 2002) in Journal of Cold War Studies 7, 1 (Winter 2005): 200–02. George Washington University, The Cuban Missile Crisis: International Perspectives, October 2012. John F. Kennedy Library, The Cuban Missile Crisis at 50. October 2012. American Historical Association Annual Meeting, Chicago, IL. January 2003. Presented Paper: “Debating the Historical Value of the Presidential Recordings.” With Kent Germany. Panel Coordinator. Historyinpieces.com is a participant in the Amazon Services LLC Associates Program, an affiliate advertising program designed to provide a means for sites to earn advertising fees by advertising and linking to amazon.com.